As good as anything from a well known brand Review by Korneel "Korneel"
Nice and Easy, Review by Alexander Popov-higgs "alexthief"
Good price, works as advertised Review by L. J. Hartman "L Hartman"
ve purchased RAM from Kompbay several times via the Amazon website and have only had one instance of a faulty piece of RAM. I followed the Amazon returns process to send it back post-free and quickly received a full refund. I've always found their products to be good quality and competitively priced with prompt delivery, even with the Super-Saver delivery option. New memory, not used, good price, working as expected. Excellent packaging. received within delivery time. Good memory Review by Slobodan Petrovic "Boban"
Yep, works fine, slotted into an old imac and was seen straight away and working ok.
Upgraded my MacBook from 1GB to 4GB, and it's as though I have a new computer - fantastic! Thank you - very good service. SDRAM, Review by C. L. Rowe "Buche Wurm"
RAM modules were received quickly and properly packaged, with enough protection. Since I installed them, I haven't had any problem, I hope this will be the case for a long time, which will make these items excellent value for money. Bought this memory to revive an old laptop that had slowed to a crawl because it only had 512 Mb memory. Fitted this memory and the laptop was transformed. It will never break speed records but is now perfectly usable - a new lease of life. Quick, Accurate and Cheap, Review by Mr. Anthony J. Murphy "Tech Smurf"
Buying laptop memory can be an expensive endeavour depending where you buy it from, however, this product was easy to find, buy and install into my mums laptop as part of a Christmas Laptop upgrade. The delivery was quick and the order was dispatched almost immediately which also helped when a speedy fix is needed. I have been fixing laptops and PCs for over 5 years and this memory worked like a dream - no issues whatsoever. Needed to enhance old laptop with 1GB of RAM and Windows 7. After I upgraded it with this kit to 2GB of RAM you could see a noticeable difference in speed and performance. Perfect for an upgrade Review by Ainsley001 "Ainsley001"
Cheap and nasty Review by David H "davidhodges5"
This did the job in bringing an old macbook to life. the fitting was easy. Working out what to do was easy - just look for a tutorial on You Tube and follow it. No compatability issues, it just worked. Painless upgrade! Review by Else "Z rider"
Not much to say about a memory module really. Great memory, well packaged, works fine. I was upgrading a laptop for a friend and extra memory made a significant difference to the speed of the laptop. The memory was delivered more quickly then the estimated delivery date and was in easily accessible packaging. Very Cheap 2gb twin pack, delivered quickly and HSS a significant speed increase in an old laptop running windows 7. Bought this RAM stick for a low-performance computer, which was running with only 1GB RAM, and obviously doing too many HDD swaps. Not fitting my computer Review by F. Lebon-springall "France Goodwill"
I chose this product and supplier because it was competitive on cost. The memory was delivered within the timeframe expected and when installed in the PC to replace the original 2 x 1GB memory cards, there were no issues then or after several weeks of use. It worked straight out of the box as one would expect. My PC now runs faster with the additional memory and I've probably extended the life of the PC by at least a year. Was wary as this is an unknown brand to me, but looked solid in spec. As ever Windows 7 does not perform very well with less than 4 GB of memory. So I was delighted to find this offer from Komperbay so that I could upgrade from 2GB to 4 GB. Fitting was a doddle and my Panasonic Toughbook now works at a reasonable speed. The price of these modules was very competitive and they work perfectly. I felt safe in buying them on Amazon as there is never any quibble over returns. That's very good, until now there is no problem. 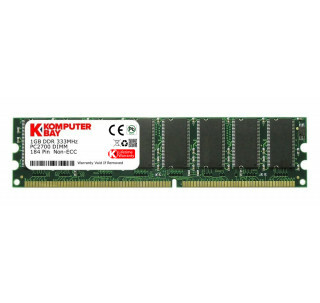 Komputerbay came to the rescue with affordable but reliable memory that got me going again.